Tony Arnel is global director of sustainability at Norman Disney & Young, an engineering consultancy firm. 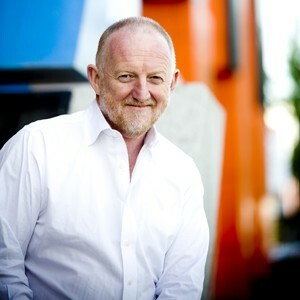 He is a founding director and chair of the Green Building Council of Australia, and former chair of the World Green Building Council. Architecture & Design spoke to Arnel about why a lecturer sparked his interest in sustainability, the politicisation of the climate change debate and why the PIXEL building was a game changer. Was there ever a defining moment for you when you realised you wanted to be involved with sustainability in the building industry? My interest in sustainability started at university. It was the 1970s and I was inspired by my building science lecturer who preached the virtues of passive design and living within your means. While he never used the word ‘sustainable’, that was his fundamental philosophy. Fast forward to the 1990s and I was a director at the City of Melbourne. It’s hard to believe now, but the city was a basketcase – no one lived there, retail was dying and it was a 9 to 5 city. We had to reinvent it. The urban planning policies we put in place 20 years ago, encouraging city living, the laneways program, the parks, Federation Square, new retail strategies, the attention to detail with the public realm, the list goes on, have made Melbourne one of the world’s best and most liveable cities. I’m pleased to say sustainability was, and still is, a fundamental driver and differentiator. How has the approach to sustainability changed in the past five years? A lot has changed in five years, particularly here in Australia. For a decade up until 2010, the east coast of Australia experienced an extraordinary drought which raised public awareness on climate change and its consequences. There was a great deal of public interest in being sustainable and responding to, in particular, water shortages. Disappointingly, despite the overwhelming scientific evidence (including very recent reports), public sentiment is not what it was and there has been a dramatic shift to conservative politics which chooses to ignore the reality of climate change. Politics and public sentiment will wax and wane, but the effects of climate change will not go away and are likely to become more severe. However, two things give me hope. Firstly, I think the business world is showing leadership and demonstrating that sustainability and business are mutually entwined – you can’t have one without the other. Secondly, I have great faith in the next generation to stand up for what matters. If my generation of baby boomers don’t get it, then I really believe it’s our kids and theirs that really will make the difference. What is one thing that still needs to be changed? The way we have politicised the climate debate. It’s very disappointing that in an educated country like Australia the science around climate change is reduced to the politics of difference. If one side says yes, the other says no, notwithstanding the overwhelming evidence. Surely there must be some issues, like climate science, where there is common ground and a bipartisan approach can ensure we act intelligently? People sometimes say the decision to build or design something sustainable is up to the client and if the client doesn't want it, you can't force it. What advice would you give to people who have clients that are reluctant to adopt sustainable practices? The response is very simple. Ultimately it’s about value and quality. When people coin the term ‘green’ building we are really talking about improving building performance, whether it’s in energy or water efficiency, using quality materials or eliminating waste. The link between indoor environment quality and productivity and well-being has now been well and truly established, which is another reason to invest is sustainability. Importantly, we now have a decade’s worth of data that demonstrates how green investments improve the value of buildings. So to me, it’s a no brainer. Adopting sustainable design practices improves the operational efficiency of a building, providing costs savings and improving the building’s value. What building do you wish you had been involved in and why? I’ve previously nominated PIXEL in Melbourne simply because it was so groundbreaking at the time. Obviously it was experimental, but it brought together so many green technologies and demonstrated to the market place that the boundaries of sustainability were attainable. It was a game changer. I’ve also always loved the work of Frank Lloyd Wright. In my mind he was the original green architect. Eighty years ago he designed a house in Pennsylvania called Falling Water using local materials, natural light and flow through ventilation, relying on his philosophy of harmony with the environment. Another favourite Lloyd Wright building is Taliesin West in Scottsdale, Arizona which was his winter home and studio. It’s still used as an active education centre teaching the basics of sustainable design by virtue of its own existence. If you weren't involved in the building industry, what would you like to be doing? It’s actually hard to imagine not being involved in the building space, something I’ve been connected to in one way or another since I was in architecture student – and that’s 40 years ago! The best career advice is to do something you love, because you’ll never work a day in your life. This has certainly been true for me.